We firmly believe that integration with third party dental products should be a function available in The Complete Exam® (TCE) software and not an expensive option. 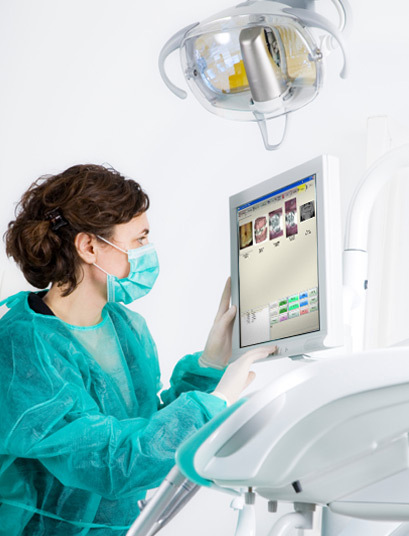 Accordingly, we provide bridges, or integration links, to most of the dental imaging programs, Myotronics K7 diagnostic programs, and several others. We also provide a user configurable bridging function that you can set up yourself (we will help, of course) for virtually any other program you care to bridge with. The degree of integration possible varies with the capabilities of the other program, but all digital imaging programs, digital x-ray programs, and such provide good bridging methods. Some companies will try to tell you bridges are not a good way to integrate with another program, but that is only true of poorly developed bridges or those that were designed in a very proprietary way by a company that is trying to justify a hefty price for its optional bridges. A well-designed bridge that follows both sides' prescribed standards prevents program updates on either side from breaking the bridging link. Bridges that break whenever one side updates their program only occur when the party selling the bridge tries to make a proprietary bridge that circumvents established standards. Software producers only do this to prevent you from reconfiguring the bridge to work with some other software than originally intended, thereby forcing you to purchase another bridge for your next software purchase. The lack of interoperability or compatibility sometimes seen between programs is the precise motivation behind the current push for EHR standards in order to allow communication of health information between various, separate programs. This web page was last updated on Thursday, March 1, 2018. Site map -- ©2018, DBM Enterprises, Inc.